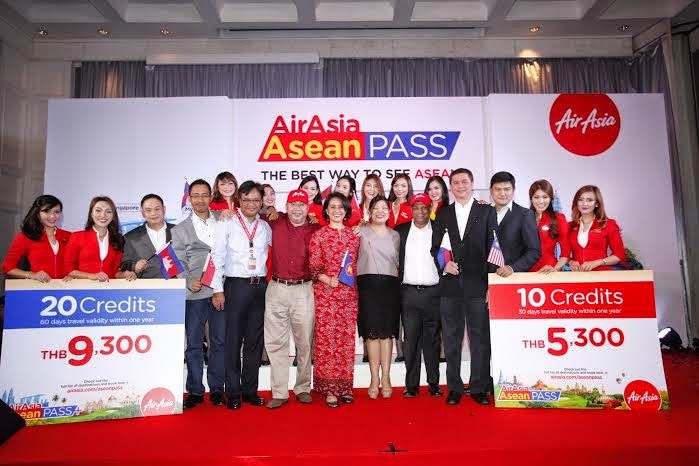 BANGKOK, 23 February 2015 – AirAsia introduced the “AirAsia Asean Pass” and the “AirAsia Asean Pass+” in an effort to boost travel by making traveling within the region a seamless experience. The passes are available from today at www.airasia.com, with the AirAsia Asean Pass retailing at P7,200 for 10 credits and AirAsia Asean Pass+ for P12,900 with 20 credits exclusive of terminal fees and airport taxes. The co-founders of AirAsia; Tan Sri Tony Fernandes and Datuk Kamarudin Meranun announced the development of this product at the ASEAN Business Advisory Council Malaysia Conference held in Kuala Lumpur in November last year. Holders of the AirAsia Asean Pass and the AirAsia Asean Pass+ can enjoy flights at a fixed-rate to over 148 routes across all 10 Asean countries. Acting like a single currency, it diminishes the hassle of different foreign exchange rates as flights are valued according to credits, allowing guests to be creative in planning their ideal trip through Asean. Flights with duration of below two hours are valued at 1 credit, while flights of two hours and above are valued at 3 credits. No processing fee applies for flight redemptions using the AirAsia Asean Pass and Asean Pass+. Airport charges/tax and other fees will be payable separately. The pass can also be purchased as a gift for another traveller. The AirAsia Asean Pass and Asean Pass+ credits are redeemable for travel with AirAsia Malaysia (AK), Thai AirAsia (FD), AirAsia Indonesia (QZ) and Philippines AirAsia (Z2 & PQ) to Asean destinations only. For a detailed list of flights redeemable with the AirAsia Asean Pass and Asean Pass+ and other applicable terms and conditions, guests may refer to the airline’s website at www.airasia.com.